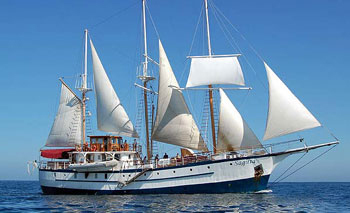 Sample the best of the Galapagos on this 5-day cruise across the Islands. Sail across Stana Cruz, Genovesa, Santiago, and Rábida Islands while spotting pelicans, herons, frigatebirds, iguanas, green sea turtles and more! Arrive at Baltra airport and transfer on board the S/Y Sagitta, your home for the next few days. Start by navigating a short distance to Black Turtle Cove, a large mangrove lagoon on the north coast of Santa Cruz Island. Pelicans and herons roost on the branches, while marine dwellers such as green sea turtles or golden rays may cruise right next to the panga (local dinghy) as it makes its way through the mangroves. The Cove also acts as a nursery for sharks. In the morning, travel up north to Genovesa Island and reach Darwin Bay (wet landing), a unique site lined with red mangroves and soft-haired prickly pear cacti where red-footed boobies and great frigatebirds perch tamely. Also try to spot iguanas and sea lions! Later, head to the Prince Philip Steps (dry landing). Climb the edge of a cliff where frigatebirds, Nazca boobies, and red-footed boobies nest. Seek out the impressive red-billed tropicbird amidst Galapagos storm petrels. 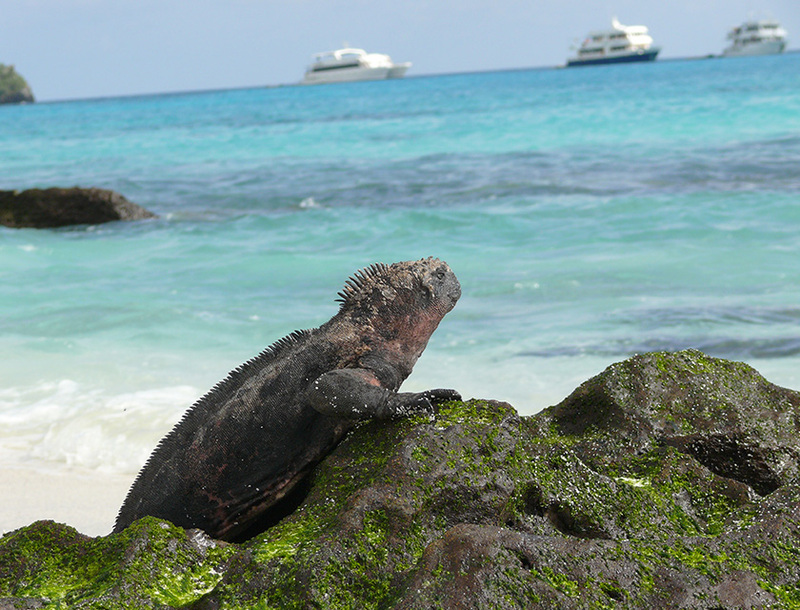 Marine iguanas and sea lions can also be seen here. Today, the vehicle will make a dry landing at Bartholomew for you to climb up the wooden steps. Reach the summit of this spatter cone for a most breathtaking panorama of the islands’ well-photographed Pinnacle Rock, views of neighbouring Santiago, and many other central islands. If you’re lucky, perhaps a lava lizard will cross your path, or might even spot a penguin! Then head to Santiago Island (wet landing) and onto Puerto Egas’ dark sand beaches to explore the arches and grottos of the coastline. Puerto Egas is a shelter for the shy and adorable Galapagos fur seal. Throughout the day, as you explore Sullivan Bay, you can spot brown pelicans, Darwin’s finches, great blue herons, lava herons, and yellow babblers. Also see lava lizards, marine iguanas, penguins, and sea lions. A wet landing is scheduled for this morning onto Rábida’s deep-red beaches to explore the red island’s fascinating interior and saltwater lagoon. Rábida is also known as ‘Mars on Earth’ owing to its deep red coloured sand and rocks. Darwin’s finches, Galapagos mockingbirds, and yellow warblers feed off the vegetation; given the right time of the year you’ll be out to find brown pelicans nesting on salt bushes along the beach. The island displays a large variety of lava formations as well. Occasionally, penguins can be spotted here; seals and flamingos are more common. Then head to Cerro Dragón on Santa Cruz’s northwest shore (dry landing). Visit a saltwater lagoon, home to greater flamingos, black-necked stilts, and white-cheeked pintails. Further inland, find a fantastic land iguana nesting site. Visit Bachas Beach (wet landing), a white sand tropical heaven where green sea turtles nest, and walk up to a salt-water lagoon where flamingos may be feeding. Look out for Darwin’s finches. The ship will then take you back to the shore at Baltra for your onward journey home. After the cruise, transfer from Baltra to Santa Cruz where you will visit the Highlands to see the famous Galápagos giant turtles in their natural habitat. Afterwards, your private transport will take you to the Royal Palm (5 stars) or Silberstein Hotel (3 stars) to have a delicious lunch and enjoy its facilities. In the evening, drive to an exclusive restaurant, Angermeyer Point, for a very special dinner to say good bye to this beautiful archipelago. Then return to the hotel for a good night’s sleep. 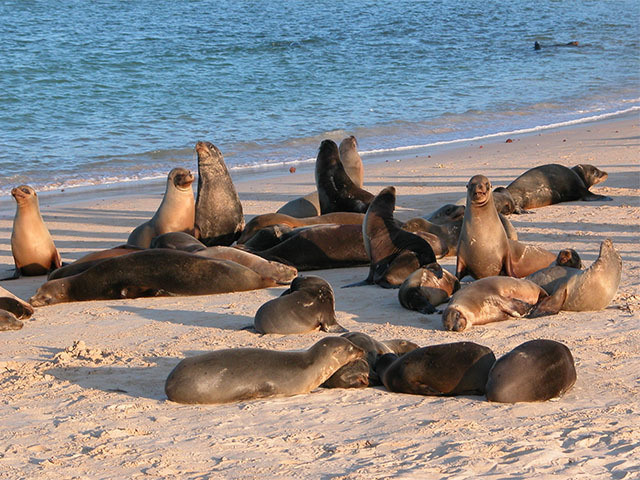 This is the end of your 5-day Galapagos Sampler. The next morning, after a hearty breakfast, transfer to Baltra´s airport for a flight back to mainland Ecuador and continue your journey home.